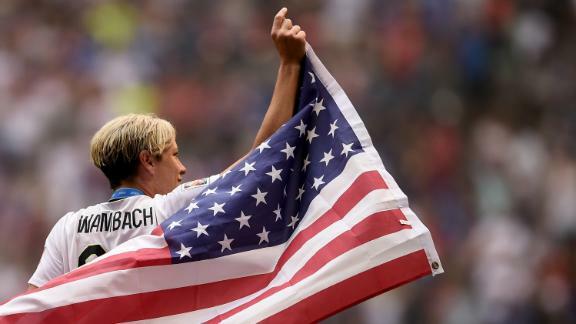 Abby Wambach (20) is set to retire from international play. On the day of her farewell, U.S. women's national team star Abby Wambach called for U.S. coach Jurgen Klinsmann to be fired and blasted him for bringing in "a bunch of these foreign guys." The top scorer (male or female) in international history made her comments on a Bill Simmons podcast published on Wednesday, adding that there are "too many egos in our men's program." The 35-year-old Wambach, who helped the U.S. women to World Cup victory this past summer, plays her final game Wednesday as the U.S. women face China in a friendly in New Orleans. In her time with the United States team, she's won virtually everything a soccer player can win, including two Olympic gold medals and the 2012 FIFA Women's Player of the Year, which she and Mia Hamm are the only Americans to win. "I would definitely fire Jurgen [Klinsmann]. Sorry Sunil [Gulati], sorry, U.S. soccer, but I don't think Jurgen and this litmus test on him has worked. He hasn't really focused, I feel, enough attention on the youth programs. 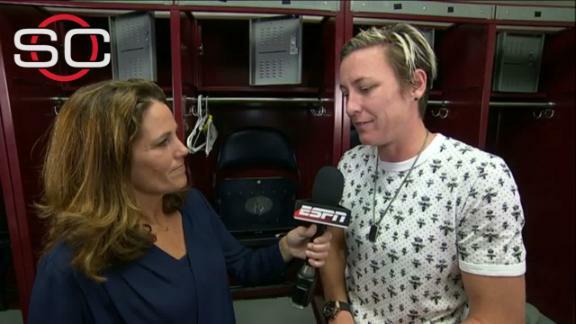 Although he says he has, I don't think that he has," Wambach told Simmons. "The way that he has brought in a bunch of these foreign guys is not something I believe in wholeheartedly. I don't believe in it. I don't believe in it in my heart. "And I love Jermaine Jones, I love watching him play, and I love Fabian Johnson, and he plays in Germany and is actually killing it right now after being sent home for 'faking an injury.' But I just think that this experiment that U.S. Soccer has given Jurgen isn't one that personally I'm into. It's gotta be interesting for those guys to see their coach take off in a helicopter and fly home to his home and then back to training." U.S. Soccer chief Gulati would not be baited by Wambach's comments. "Abby has never been shy of speaking her mind, but today it's best to celebrate a wonderful career and character," he told ESPN's Julie Foudy. Wambach, who has scored 184 goals in her career, was asked by Simmons what she would fix about the U.S. men's national team, and in response she was outspoken in her criticism of Klinsmann and discussed the pay gap for female athletes. "It seems to me there are too many egos in our men's program right now, and the bigger ego of all of them is the one who is leading the charge," she said. "Ever since I announced my retirement, I have been able to have cool conversations and pick people's brains to figure out why there is such a disparity, not just in my sport but in other sports and other industries. There is there innate thing that women are less than, that women don't deserve to be treated fairly. "I think that our society is pushing toward a place where we really start to look to each other as people and not put each other in these boxes. ... I feel the men get paid way more than the women in soccer, yeah, I understand logically the argument about the ratings and that is more global. But that doesn't mean that it makes it right. Equality isn't something that actually costs anything. I know we are talking about gender pay gap differences. But to treat someone fairly doesn't cost a single cent. It wouldn't cost anything, it would be just a decision. When you are in it, you don't want to fight too much against it because you want to be thankful for what you are getting." Wambach also said that if she were to go into broadcasting, she would not hold back, saying she would fire away honestly and would go toe-to-toe with people like former U.S. star Alexi Lalas, Eric Wynalda and even Simmons. Lalas posted a transcript of her men's team comments on the podcast to his Twitter feed and asked his fans to offer their opinions. Love Abby Wambach's interesting, provocative and entertaining quotes. But curious to hear her definition of a "foreign" USNT player. Wambach reflected on the state of youth soccer in the United States, the dangers of concussions and how the game can bring in more stars from within the country. "The more money that soccer players can make in this country, you're gonna find our better athletes will be getting more involved in playing soccer," she said. Klinsmann has been credited with playing a significant role in recruiting talented dual nationals to the United States and winning challenging friendlies in Europe -- the U.S. men's team beat the Netherlands and Germany earlier this year, for example -- and escaping from a difficult group at the 2014 World Cup in Brazil. The German international has been taken to task for failing to lead the U.S. to victory in the CONCACAF Gold Cup, losing in the semifinals to Jamaica and then presiding over a Confederations Cup playoff loss to Mexico. Under Klinsmann's watch, the amount of money spent on the men's U.S. program jumped from $9.9 million in 2010 to $19.7 million in 2014, according to U.S. Soccer financial reports. Former U.S. men's team coach Bruce Arena echoed Wambach's comments about foreign-born players in a 2013 interview with ESPN The Magazine. "Players on the national team should be American. If they're born in other countries, we aren't making progress," he said.